What is ravioli? Its small pasta envelopes that contain a filling and is served with a sauce. We all are familiar with the savoury variety filled with meat, fish, cheese or vegetables and served with tomato, cheese or creamy sauce. Or just drizzled with loads of olive oil or melted butter. I am drooling as I love ravioli. 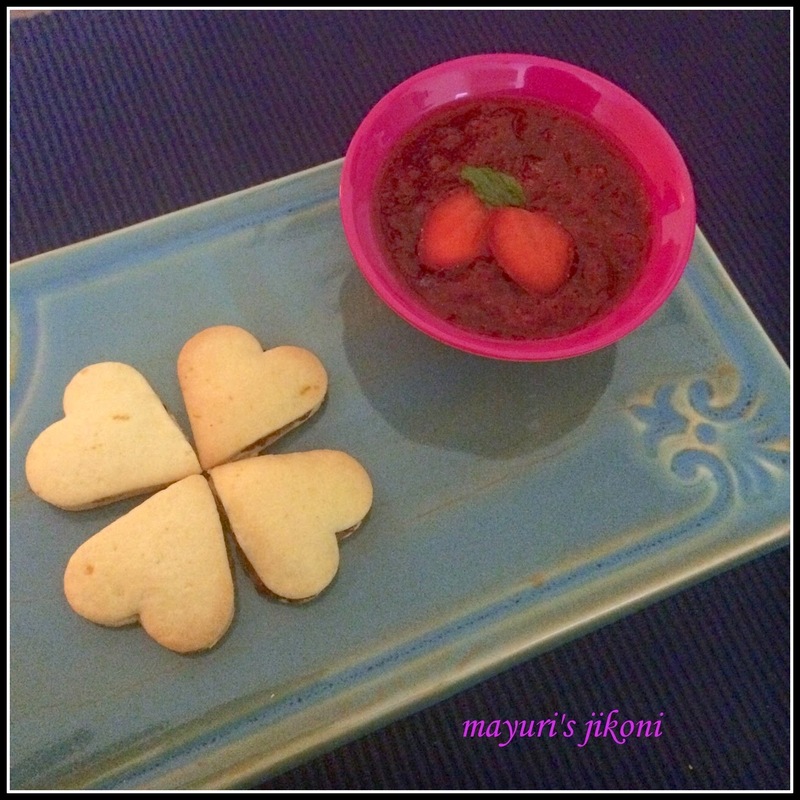 For the February shhh cooking secretly challenge I was paired with Sathya Priya Karthik. The two ingredients she gave me were pasta and strawberry. When I read the two ingredients, I scratched my head and thought ‘not exactly a lovely combination for Valentine’s day’. The first thing that came to my mind was salad. Pasta salad with strawberries. But that was too easy. I had to think out of the box. 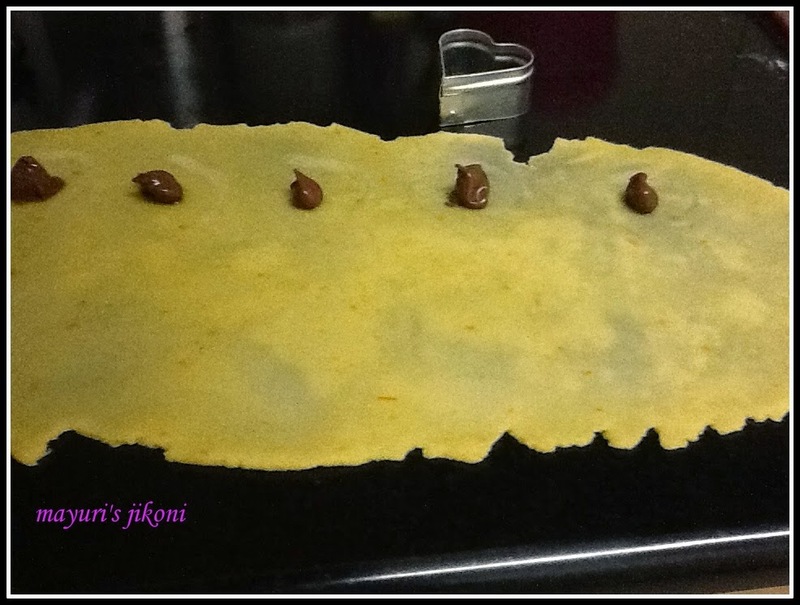 Sometime back I had come across a recipe of sweet ravioli. So decided to try that out. I did not follow any one particular recipe. Took hints from different recipes. I was tempted to fry the ravioli as its normally served but decided to make it a bit healthier by baking them. Overall outcome??? I was pleased and it was a good Valentine’s Day treat for hubby dear, loved by both daughter and hubby. Sweet ravioli or ravioli dolci is usually made during the Italian Carnevale festival. Fillings can vary from ricotta, jams, chocolates, dried fruits to sweet potato. All served drizzled with icing sugar and a variety of sauces. While the fried variety tastes crispy and crunchy the baked variety appear like cookies. How often do you think out of the box? Mix flour, zest and sugar in a bowl. Add the lightly beaten egg and form a dough. Cover the dough with a cling film and let it rest for 30 minutes. Divide the dough into two parts. Cover one part and roll the other one into a thin sheet with the help of a bit of flour. Make the sheet that’s about 8″X16″. I was finding it difficult to conform to the size so I just rolled the dough thinly till I could see the surface through it. 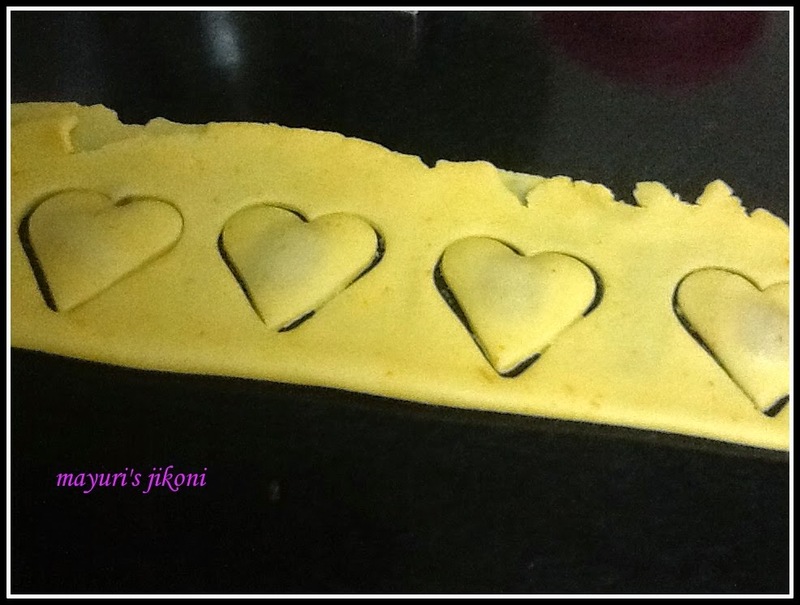 Since I wanted to use the heart shaped cutter, I gently made marks with it on the rolled dough. Place about a ¼ tsp of the nutella filling in the marked area. Gently brush water around the nutella. Roll the other dough into a thin sheet. Place it over the first rolled dough. Cut heart shapes using the cutter so that the nutella blob is more or less in the middle. Place the cut ravioli on a greased baking tray. Use the remaining dough again. Roll it out and put the filling. Bake the ravioli for 15 -20 minutes or till they are golden brown. Remove the ravioli dolci from the oven. Let it cool on a wire rack. Wash and hull the strawberries. Cut them into quarters. Place the strawberries, water and sugar in a pan. Cook the strawberries over low heat till they become soft. Pour the sauce into a serving bowl. 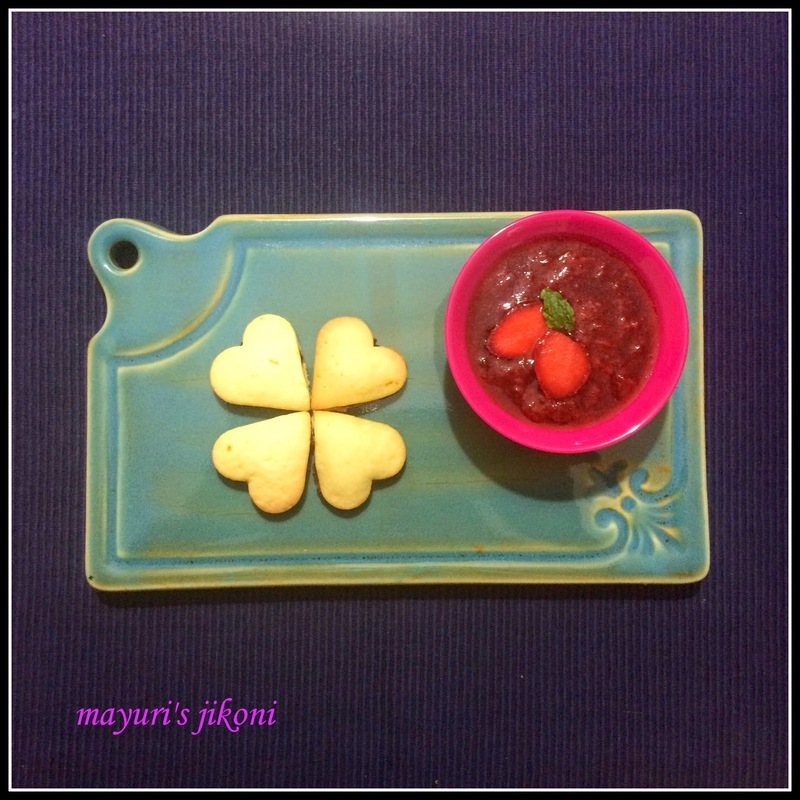 Serve ravioli dolci with strawberry sauce. You can add a filling of your choice. Jam, dried fruit, ricotta cheese or chocolate. Serve ravioli dolci with any other fruit sauce, chocolate sauce or fresh whipped cream. The next day I served the remaining ravioli dolci with some ice cream and strawberry sauce. I got about about 32 pieces as the cutter was small. So the number of pieces will entirely depend on the size of cutter. You can cut them into normal squares with a fluted cutter. If the remaining dough becomes too tough, add a few drops of water and roll it. Or use the dough by frying it and serving as a starter with a dip. If you find placing another dough over the first one, then just fold over. Check out the picture above. Avoid using too much flour while rolling or the dough will become tough. 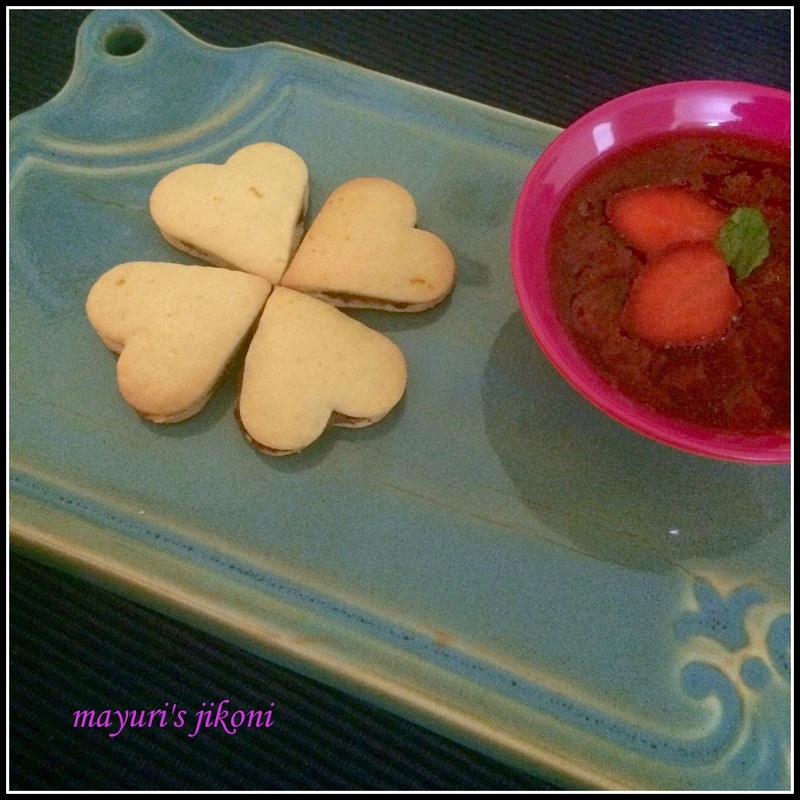 Thats a delious treat mayuri..
That is a god idea for those two ingredients. I hope you have enjoyed your trip to India. What an innovative way of serving ravioli. The strawberry sauce looks amazing. Thanks Sadhna, had a lovely time in India. Mina I too love the strawberry sauce. Goes well with ice cream, pancakes.